Just because it is colder outside, doesn’t mean your exercise routine should go into hibernation. While exercising outdoors is easy in the summer due to comfortable temperatures and longer days, winter is the exact opposite. Colder temperatures and shorter days usually means exercise routines that are based outdoors get moved indoors or just get put on hold altogether. If you put your routine on hold during the winter and plan to start when the weather gets warmer, you are basically starting over again. The body doesn’t hold on to it’s fitness capacity. The old saying “Use it or lose it!” certainly applies. If you want to look good in summer, start NOW – bodybuilders, triathletes, runners, tennis players, etc., all plan their workouts throughout the year so they are ready for their competition. Starting and/or maintaining your exercise routine now will reap benefits for the summer. Exercise keeps your immune system healthy – winter is traditionally the time of year when colds and flu season hit full force. Regular exercise keeps your immune system revving strong which will help keep you healthier during the cold and flu season. Avoid the dreaded winter bulge – weight gain during the winter is fairly common as physical activity slows down. Winter weight gain can be up to 8-10 lbs, possibly more. Exercise helps you burn excess calories and avoid gaining weight. Take 10 minutes to warm-up indoors first doing foam rolling, mobility exercises, and some light calisthenics to get the blood flowing before you step out in the cold. Dress in layers – this should seem obvious, but it cannot be overstated. Use a base layer that is snug to help move sweat from the skin. Stay away from cotton. Use a synthetic fabric (polypropylene, capilene – Under Armout, Nike all make base layers). Cotton hold on to moisture and this will make you cold. Next, wear a fleece to provide insulation. If it is really cold outside, you may need a thicker fleece. If it is really cold, don’t forget the hat and gloves. If the temperatures are below freezing, wear a light weight wind/water resistant jacket (Goretex). If it is really, cold wear a ski mask to shield your face and also wear some extra socks. Exercise with a friend – going outside to workout can be better with a friend. Having a friend will help motivate you and will provide security for each of you if exercising when it is dark. Make sure you can be seen – exercising in the dark can make it hard for others to see you, especially vehicles. If you are running or biking during the winter when it’s dark outside, wear clothing that is reflective or wear a reflective vest. A headlamp can be vital to help you avoid an potential hazards. 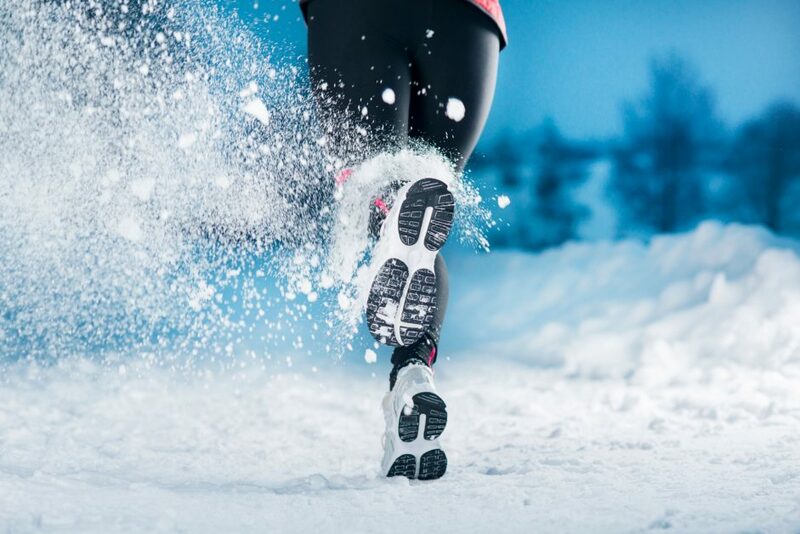 Keep your goals in sight – remember why you are exercising in the cold. Keep your goals in sight and constantly make adjustments as needed. Not sure how to set goals? Check this blog post out. Stay hydrated – even though you may not sweat as much in the winter due to the lower temperature, the lower humidity forces your body to exhale more water. So make sure you drink plenty of water, even if your not thirsty. If moving indoors is more your speed, try to simulate your outdoor workout as closely as possible. If you run, do your workout on the treadmill but spice it up and do some intervals to make the time go by faster. If you ride, try an indoor group cycling class at the gym or put your bike on a trainer. With the advent of technology, you can do virtual rides or runs nowadays from the comfort of your own home in a group setting. Winter is also a great time to hit the gym for some good old strength training. Building strength during the winter helps you look and perform better once you can get back outdoors. Hit the gym a few 2-3 times/week to improve your strength levels. If you need some help, hire a personal trainer or try online training.